What they do, how they do it and why it matters. Somebody once said "If you want something done, ask a busy person to do it...."which, in thinking about Susan Glick, is precisely the thought that springs to mind. And how is it that Susan keeps herself busy? Well, there's her position as Vice President, Women's Apparel, Merchandise Mart Properties. Fashion Group Liaison to three districts, overseeing regions in ten cities in the United States, and regions in six foreign countries. "Let me tell you something. I'm from Chicago. I don't break." So, tell us about the early years. Where were you raised? Born and bred in Chicago and exposed to everything this amazing city had to offer - culture, theater, architecture, world class shopping. It certainly influenced who I am today. What about your parents - what did they do? Fashion must have been inherited - my father was a millinery manufacturer, my mother a homemaker. One brother - extremely smart - a trained pharmacist, chemist and principal in a company that develops and manufactures private label cosmetics. How did you earn your first dollar? At my first "part time job" on Sunday mornings at Carson Pirie Scott, arguably Chicago's leading department store and, from my perspective, the city's most popular shopping destination. I was hired as a phone operator taking orders from customers who had found an item in the weekend advertising section. What an education! What were your first thoughts about a career; what did you think you were cut out for? I would say that my department store experience at Carson Pirie - albeit part time - opened my eyes to the exciting world of retail and I decided to pursue it. I managed to talk my way into the store's fashion office as secretary to the fashion director, Ardelle Tuma, and I knew, at that moment, that fashion was my passion. Ardelle was rare among the fashion directors of the time. She traveled all over the world and had an incredible eye -not just for fashion, but for anything and everything a man, woman or child could ever want or need. 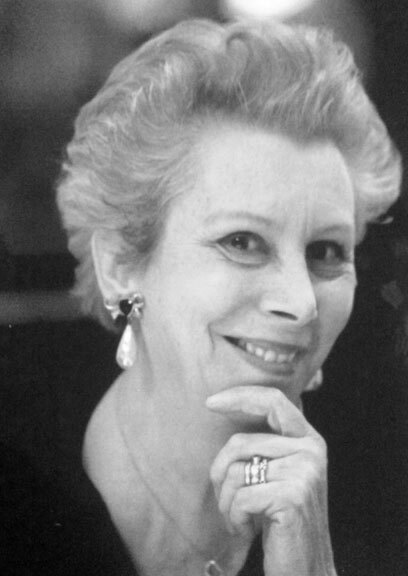 Her admiration and respect for FGI was contagious and, in fact, when she left Carson Pirie, she moved to New York and became an officer of Fashion Group. As for me, my passion for fashion and retail led me to positions with Bonwit Teller and Saks Fifth Avenue. Your employer, the Merchandise Mart is owned by Vornado, a real estate organization . When and why did you join the organization and, as vice president, apparel marketing, do you think of your area of responsibility and/or expertise as real estate or apparel or both? I have been part of this organization for over 30 years. My responsibilities definitely lie within the apparel industry and trade show division. There is an excellent team that deals exclusively with the real estate and leasing duties. I was recruited to join the team by Dorothy Fuller who had been with Marshall Field 's for some years before founding her eponymous business, Dorothy Fuller Productions. She also founded the Chicago Apparel Industry Board and was credited with "putting the 'chic' in Chicago." She was a mentor to me and a well- respected FGI member for many, many years. What are the primary responsibilities of your position and what's fascinating about your job? Do you have people reporting to you and, if so, what's your management style? Yes, I have a very capable team that reports to me and is instrumental in the success of our trade shows. I would like to think that my management style is one of inspiration by example. How do you lead? How do you persuade people to embrace your ideas and directives - especially those who may be hard to convince? I have found the best way to convince someone is to share my enthusiasm and spirit of creativity for a project. Bringing someone "on board" means explaining your vision in an inclusive way. In essence, "Help me make this happen". The only constant is change in this industry. We must recognize that the only way to move forward is to acknowledge, anticipate, explore and embrace what's next. Finding a seamless integration between bricks and mortar and online is key. Can we talk about Fashion Group? I think it's safe to say that, quite possibly, you may be the most active, dedicated, multi-tasking member ever. In fact, you give new meaning to the word volunteer. Which of those roles presents the greatest challenges; which is the most rewarding; the most fun, if that's the right word? Happy to share the fact that each of these responsibilities gives me so much satisfaction. I am grateful to play a small part in Night of Stars and Rising Stars. It is definitely the icing on the cake for my involvement in FGI. If the Regional Conference is the most challenging then I can honestly say it is also the most rewarding. To share the vision of FGI with every region is a responsibility that I take very seriously and can only be accomplished with the help of my peer, Shawny Burns, the entire NY team and the dedicated Regional Conference Committee.. Which brings us back to the career question: Did you ever consider a career in broadcasting or voice overs? What would you say are the three qualities that got you where you are today? Hard work, tenacity and having someone open the door of opportunity for me. One thing you're exceptionally good at? Bad at? I can visualize a project through an editorial eye. I am definitely not someone with a great deal of patience in reserve..
What would be your most memorable "aha" moment? When my mentor, Dorothy Fuller, offered me the job of Fashion Director assuring me I could do the job when I had doubts. I am happiest sitting in a theater watching a great play. On behalf of Fashion Group International, we are grateful, indeed, for all that Susan Glick brings to the organization and to those fortunate enough to know and work with her.